Last night we watched the Julie & Julia blu-ray movie. I have been determined to see it but the fact that I live with a house full of the male species meant that I had it on my wish list but I did not manage to see it until now. Did I enjoy it? I did, the setting in France was beautiful. New York, not quite so beautiful...but interesting. The food was delicious. The story, funny and sweet at the same time. I do not always watch the extras but because of the subject matter of this movie, I did. Therefore, I can say that when you see this movie, if you are interested in the world of food and cooking, you should definitely check out the extras. One of two special feature sections on the blu-ray disc is about the life of Julia Child and featured a large selection of real people from her life recounting stories from their time with Julia. It was interesting to hear and see what it was like being a part of her life. The other section was about the making of the movie and was filled with interesting bits like the fact that the actors weren't alllowed to hold back in their appreciation of food. What would a food movie be if the actors didn't wholeheartedly consume the food? Meryl Streep said she put on 15 pounds during the making of the film...and it took a year and a half to shed that extra weight. And, in case you were wondering, no, Meryl Streep really isn't that tall. I'd recommend this movie to anyone who likes a good drama that has some comic moments. My husband wasn't too sure at the beginning if he was going to like it but, in the end, he said, yes it was enjoyable. 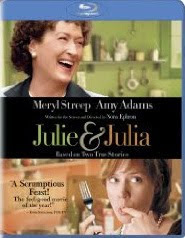 Click here to read more about Julie & Julia the blu-ray movie on Amazon Amazon has it at 50 percent off the list price & there is only $3 difference between the cost of the blu-ray and the DVD. Do I need an HDTV before I buy a blu-ray player? Looking For The Chocolat Blu-ray Movie? 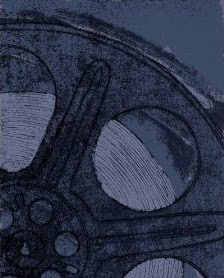 Will My DVD Player Play Blu-ray Movies?